This article was submitted by Joshua Alexander, a member of a newly formed Deep Adaptation Forum in the Coaching and Counseling group. This is a fine example of how many different disciplines intersect in this exploration of how humanity will cope and adapt as we face the collapse of Earth and human systems. the newly formed, Deep Adaptation Forum. Until recently I have regarded myself as a climate change observer. Someone engaged with the daily reports of confronting news about the climate, but emotionally detached from the information itself. The information was too abstract for my emotions to be engaged, the warnings provided by experts in the field and global institutions rarely extended into a felt sense of what it meant. The numbers and the sheer destruction unfolding are too big for my heart to comprehend. Of course, I am someone who connects with nature for my physical, emotional and spiritual wellbeing and it is not uncommon for me to be deeply moved by a nature documentary or witnessing the destruction of our natural world. But climate change itself, and the warnings from our scientific community has not been felt in the same way. However over the past year, in particular, this summer, I have felt a growing sense of concern and anxiety regarding the state of our natural world. Canberra, my hometown, just experienced its hottest summer on record (again), with a record 24 days with temperatures exceeding 35 degrees Celsius, beyond the projected weather extremes made for the year 2030 (12 days per year that exceed 35 degrees). I also realised last year that my workplace was not inundated with Bogong moths, and then later read that their population has collapsed and those species reliant upon them for food are now starving, which aligns with the broader global collapse of insect populations. In November 2018, up to 30 000 spectacled flying foxes died in a three-day heatwave in Queensland, which accounted for a third of that species population. In January 2019, extreme weather and ongoing low river flow led to the unprecedented death of hundreds of thousands of freshwater fish in the Murray-Darling River system. Then in February, a flash flood in Queensland killed half a million drought-stressed cattle and countless native species. Amidst these events, David Attenborough, one of my heroes, stood up in front of world leaders and warned ‘if we don’t take action [on climate change] the collapse of our civilisation and the extinction of much of the natural world is on the horizon’. These stories, along with the hundreds of others I have read over the past few years, have all had an accumulative effect on my emotional wellbeing. At times, quite literally, keeping me up at night. The ultimate trigger point for me was my exposure to the growing number of academics, activists and concerned citizens who have started to express the view that the collapse of our environmental, agricultural, social, economic and political systems is inevitable, and is already happening. Indeed, when I reflect on my time in Syria, visions of the environmental strain from its worst drought on record come to mind, and the subsequent war is for me symbolic of the fragile and dependable relationship we humans have with our natural environment. A relationship that is often ignored, and at worst, forgotten. The effects of climate change, and the growing concern of how it will impact the Earth understandably is taking its toll, both personally and collectively, on our physical and mental health. Mental health professionals are increasingly vocal of this link. Our bodies are adapted to the climate we live in, but I think we are also psychologically adapted, so when we live in a very hot or very cold climate we expect certain maximum temperatures and certain minimum temperatures. The American Psychological Association reported that the US Global Change Research Program found ‘people’s anxiety and distress about the implications of climate change are undermining mental health and well-being’. The report highlights the impact climate and weather-related natural disasters have on the mental health of those impacted by the event, including anxiety, depression and post-traumatic stress disorder (PTSD). Those most at risk include children, pregnant women or women supporting a newborn, people with pre-existing mental health issues, economically disadvantaged people, the homeless and first responders. Unsurprisingly, the report also identifies that ‘representation of climate change in the media and popular culture can also influence a person’s stress response and mental well-being’. Many people may also feel seriously concerned, frightened, angry, pessimistic, or guilty in response to climate change. Qualitative research finds evidence of some people being deeply affected by feelings of loss, helplessness, and frustration due to their inability to feel like they are making a difference in stopping climate change. New terms such as ‘eco-anxiety’, ‘climate change anxiety’, are sometimes used to describe this. Personally, many of the issues detailed above I have witnessed, either in myself or people I know. I’ve witnessed friends very active in the climate change movement experience long nights of the soul, coming to terms with the predicament faced by humanity. I’ve witnessed shocking violence in the streets of Cairo, which at the time was explained to me as a result of the extreme heat waves experienced by that city. I ride emotions of extreme helplessness, of guilt, feelings of powerlessness because I am handcuffed by my job, my financial security, my wants, needs, desires, and dreams. My vision of the future does not include the type of world that is presently unfolding. Many years ago I read 2052: A Global Forecast for the Next Forty Years authored by Jorgan Randers, a member of the Club of Rome that first identified climate change in the 1970s. Randers details the deep depression he has gone through witnessing the continued destruction of the natural environment, and the lack of action by governments to address the issue of climate change. He also explained his almost spiritual acceptance of our fate and learning to love what is, rather than mourn for what was. This message has also been conveyed by Professor Jem Bendell, a sustainability expert from the University of Cumbria and former World Wildlife Fund executive. Bendell, who has created the Deep Adaptation framework as a means to understand and respond to this environmental crisis, explains that we individually and collectively need to let go of the notion that we’re in control and that a collapse of our global system is inevitable based on current data. Bendell, who has had to do deep inner work to face this crisis, refers to the opportunities that exist for individual and collective action in light of our pending disaster. He talks about people having to surrender to the process, seeking emotional and spiritual support to deal with the emotional impacts that are likely to occur, and through this process of acceptance, invest our energies into what is important; our loved ones, our community and action against those that seek to undermine the preservation of our natural world. We’re witnessing this type of action every day. The international social movement Extinction Rebellion is growing, as is the youth movement headed by Swedish activist Greta Thunberg. Indeed, as I write this piece, tens of thousands of students around the world are mobilising for a massive global protest on 15 March. As noted earlier, the Deep Adaptation movement is bringing people together to discuss the best ways to respond to a societal collapse, whilst Indigenous communities, many having experienced societal collapse due to colonisation, are on the frontline, warning humanity of the damage it is inflicting upon the environment, and fighting against morally corrupt corporations and governments that are destroying their nation’s land, water and our Pachamama. · validating people’s experiences of responses to the climate crisis; helplessness, grief, anger, despair and fear all have their place in this work. Many of these approaches understandably are intellectual and cognitive exercises; however, therapy practices, such as breathwork, provide a non-verbal exploration into the underlying feelings about climate change and its impact on our lifestyle, our families, communities and our world. Indeed, whilst climate change is the facilitator of this emotional and spiritual upheaval, it is secondary to the underlying primary emotions that we may not be consciously aware of. Climate change, at a personal and collective level, is forcing us to face our relationship with change, with discomfort, the loss of control, fear and anger. At its heart, climate change is compelling us to face death, whether it is our literal death, the death of our loved ones, the death of a species or a natural environment we care for, or the death of the old Self, an Ego death, and the presumptions we once made about our future. Millions of people are already on this journey of self-exploration and many more will be forced to do so based on current climate predictions. People are communing with nature through Vision Quests and nature-based contemplative exercises; psychedelic therapy is remerging around the world in the form of traditional ceremonies and in mainstream therapy practices. People are using breathwork, movement, dance and other altered-state therapeutic practices to look within. It sounds bleak, but I anticipate this period as a time of growth. Individually, it provides us with the opportunity to drop what’s not important and focus attention on our heart’s calling. Climate change is the vessel that takes us within, healing old wounds and integrating our fragmented selves. Collectively, it will take us toward communion, with our loved ones and our community. Perhaps think of this time as a Hero’s Journey, a collective rite of passage or a birthing process. For far too long modern society has been separated from community, guided by unsustainable individual pursuits and consumption. Loneliness has become endemic; neo-liberalism has become God. Right now, we’re on the threshold of having to let go of old patterns, beliefs and ways of life. This is a death process; however, on the other side of this death is the integration of new understandings, a metamorphosis, and the reunion with our higher selves, our community, our Earth, our home. For further information about breathwork, or other altered-state therapeutic practices go to: www.transitionbreath.com or contact Transition Breath on info@transitionbreath.com. Access the PDF version of the article here. Joshua is a qualified breathwork practitioner and researcher. His contemplative practices include breathwork, nature-based therapeutic practices, yoga and meditation. Joshua is driven by a passion for not only his own inner-world exploration but also helping others do the same. Joshua is a member of the Australian Breathwork Association and the International Breathwork Foundation. Australian Climate Council, Angry Summer 2018–19, March 2019, p. 4. Graham Peadfearn, ‘Decline in Bogong moth numbers leaves mountain pygmy possums starving’, The Guardian, 25 February 2019. Damian Carrington, ‘Plummeting insect numbers ‘threaten collapse of nature’, The Guardian, 11 February 2019. Francis Mao, ‘How one heatwave killed ‘a third’ of a bat species in Australia’, BBC News, 15 January 2019. Anne Davies, ‘Murray-Darling fish kill: extreme weather and low river flow led to drop in oxygen levels’, The Guardian, 24 January 2019. Ben Smea, ‘Up to 500,000 drought-stressed cattle killed in Queensland floods’, The Guardian, 11 February 2019. Reuters, ‘Continuation of civilisation is in your hands,’ Attenborough tells world leaders’, The Guardian, 4 December 2018. 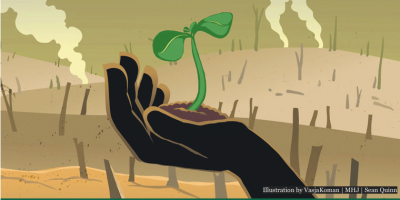 Colin Kelley, Shahrzad Mohtadi, Mark Cane, Richard Seager, and Yochanan Kushnir, ‘Climate change in the Fertile Crescent and implications of the recent Syrian drought’, Proceedings of the National Academy of Sciences of the United States of America, 15 March 2015, https://www.pnas.org/content/112/11/3241. Peter Hannam, ‘Mental health added to impact of climate change as global damage grows’, The Sydney Morning Herald, 29 November 2018. Sarah Wiedersehn, ‘Researchers found that the hotter the weather, the higher the suicide rate’, SBS, December 2018. Kirsten Weir, ‘Climate change is threatening mental health’, American Psychological Association, August 2016. Australian Psychological Society, Climate change and health, https://www.psychology.org.au/About-Us/What-we-do/advocacy/Advocacy-social-issues/Environment-climate-change-psychology/Resources-for-Psychologists-and-others-advocating/Climate-change-and-health. Jorgen Randers, 2052–A Global Forecast for the next 40 years, information available at: http://www.2052.info/. The Future Is Beautiful, Jem Bendell on Deep Adaption, Climate Change and Societal Collapse, 21 December 2019, http://www.thefutureisbeautiful.co/2018/12/27/e45-jem-bendell-on-deep-adaptation-climate-change-and-societal-collapse-acceptance-and-evolution-in-the-face-of-global-meltdown/ Also see, https://jembendell.wordpress.com/. Extinction Rebellion, Fight for Life, available at: https://rebellion.earth/. Kate Aronoff, ‘How Greta Thunberg’s Lone Strike Against Climate Change Became a Global Movement’, Rolling Stone, 5 March 2019, available at: https://www.rollingstone.com/politics/politics-features/greta-thunberg-fridays-for-future-climate-change-800675/. Deep Adaption Forum available at: https://deepadaptation.ning.com/. Rosa Gauditano, ‘Brazil’s indigenous peoples lead global “Red January” protests’, 31 January 2019, Survival International, https://www.survivalinternational.org/news/12073; Indigenous Environmental Network, Home, http://www.ienearth.org/. Zing Tsjeng, ‘The Climate Change Paper So Depressing It’s Sending People to Therapy’, Vice, 28 February 2019, https://www.vice.com/en_ca/article/vbwpdb/the-climate-change-paper-so-depressing-its-sending-people-to-therapy. Climate Psychology Alliance, CPA Therapeutic Support, 5 March 2019, https://www.climatepsychologyalliance.org/news/330-cpa-therapeutic-support. For example Nature Philosophy Australia: https://naturephilosophy.com/. Jenny Valentish, ‘Ayahuasca is the new frontier for ‘psychedelic feminism’, ABC News, 5 August 2018. Liam Mannix and Chloe Booker, ‘$1m kicked into campaign for magic mushrooms therapy’, The Sydney Morning Herald, 2 February 2019..